Separation anxiety - When a dog is distressed by being separated from its main or preferred human caregiver. Isolation distress - When a dog can’t tolerate being left alone. Containment phobia - When a dog feels trapped in confined spaces. While some dogs lean towards displaying one, predominant type of anxiety disorder, many display a combination of two or all three types depending on the circumstances. True separation anxiety in dogs refers to a dog becoming attached to just one person. Understanding the difference between these disorders, and how to treat them when one or more combinations of symptoms is present, is essential to effectively turning these behaviors around. True canine separation anxiety then refers specifically to when a dog has an intense bond with one person or preferred companion and cannot tolerate their absence, whether another human or canine friend is present or not. Isolation distress occurs when a dog becomes panicked when left alone and exhibits stress-induced behaviors such as pacing, excessive drooling, destructiveness, loss of bowel and bladder control, and/or distress vocalizations, all of which can be abated by the presence of another person or dog. Destroying thresholds is indicative of containment phobia, not dog separation anxiety as is typically thought. and digging under or jumping over a fence. Containment phobia can be considered a primal response to confinement that activates a feeling of being trapped whether a dog is being kept indoors or out. being left alone in a fenced-in backyard or kennel without access back inside the house. Containment phobia is, therefore, similar to when humans experience claustrophobia and have a panic attack when caught in a small, tight space like an elevator, a room with no windows, or the cabin of a plane. Puppies should stay with dam and litter until 7-8 weeks of age. Dog separation anxiety can be provoked by putting a dog or puppy in isolation too frequently. Pre-mature separation from a mother and litter-mates or isolation between the ages of 5-12 weeks. Adopting a dog or puppy over a long weekend or holiday and not preparing it for everyone’s back-to-work and back-to-school schedules. Trauma as a result of sudden abandonment due to owner surrender, break-ups of a family unit due to divorce or death, or as a consequence of a natural disaster. Relocation to a new residence where everything is completely unfamiliar to the dog. Any major changes to a dog’s daily routine. Unnatural isolation due to household dynamics like long working hours or the over-use of isolation as a punishment tool. Inherent traits within the canine DNA that cause a dog to experience confinement as life-threatening. Puppies need social interaction with their litter-mates and can be traumatized by being separated from their litter too soon. Dogs, by nature, are social animals and are, therefore, likely to show distress when left alone. We’ve all heard the phrase, “dogs are pack animals,” but rarely is it used in the appropriate context of examining how important social dynamics are for the mental health of domestic dogs. If you consider that the canine species’ base survival instincts are rooted in a dependence on group living, then the fact that dogs CAN and actually DO learn to adapt to spending as much time alone as is expected of them during the course of their life as a house pet is quite significant. A wolf will howl when separated from the pack. There is no conclusive evidence showing exactly why dogs experience separation anxiety and isolation distress; however, the behavior at its root is most likely based in self-preservation instincts that can be considered an expression of the typical adaptive survival mechanisms seen in all mammals (including human babies who cry when hungry). Puppies like wolf pups may bark, whine, or howl when lost or left alone so that their family can locate them. howling to locate pack members when separated from the pack. Since a puppy or adult canine who is left alone in the wild is more likely to die—either from starvation, since it has no pack to hunt with, or from attack, since it has no pack mates for mutual protection—separation from the pack almost always means certain death and will elicit an adaptive survival response in an attempt to reunite with the pack. Wolves howl to locate their pack and some dogs will do the same when left alone. Containment phobia is generally considered a genetic predisposition of the canine species and was first recognized in wolves and wolf-hybrid dogs whose guardians discovered they could not cohabitate with them. This is because any form of containment including being kept inside a home would be experienced by the wolf as a feeling of being trapped, prompting frantic escape attempts that lead to destruction of the residence. Containment phobia is, therefore, considered to be an ancestral trait of the wolf DNA that lies latent in domestic dogs and can be activated in any dog under the right circumstances. Most dogs prefer to have company, but learn to relax and nap when left alone. Some dogs, however, experience panic when left alone or confined and are in genuine distress. While many dogs feel some level of frustration when left alone, certain dogs express it through various behaviors such as chewing, soiling in the house, howling, barking, and whining or attempts to escape confinement. These are all behaviors that a young puppy or new rescue dog may exhibit when first experiencing being left alone or in confinement for the first time—but if they do not subside as time goes by and only increase in intensity, then a home-alone/confinement-related anxiety disorder is generally in the making. Dogs experience frustration when life presents them with circumstances they find unpleasant. Being left home alone suddenly may be very upsetting to a dog that is not accustomed to it. A dog with separation anxiety will become distressed when you leave their line of sight. Dogs with separation anxiety and isolation distress may feel anxious when their humans disappear from sight and get visibly or audibly agitated whenever this occurs. Dogs specifically with separation anxiety are so closely bonded with just one caregiver that they may even get stressed when their human closes a bathroom door to take a shower or go bonkers if that particular human steps out of the house for mere moments to take out the trash. All dogs follow their human from room to room, but dogs with separation anxiety may not want to take their eyes off of their beloved caregiver. They may also insist on sitting on their human’s lap or always laying by their feet since any loss of proximity causes distress. Often, these dogs will not interact with other people, preferring to curl up by themselves—away from other members of a household—when the human they are most closely bonded with is absent. Some dogs urinate or defecate when left alone or separated from their guardians—either because they are frustrated or because they simply lose their bowel and bladder control due to the stress they are undergoing—typically within 20-30 minutes of their human’s departure. If a dog urinates or defecates in the presence of his guardian, its house soiling is probably more of a house-training issue. This video illustrates the cyclical whining, howling, or barking that is typical of dogs with separation anxiety or isolation distress. A dog may bark, whine or howl when left alone or when separated from its guardian. This kind of barking, whining or howling is persistent, cycling up and down in intensity, and doesn’t seem to be triggered by anything except by being left alone or their main caregiver’s absence. 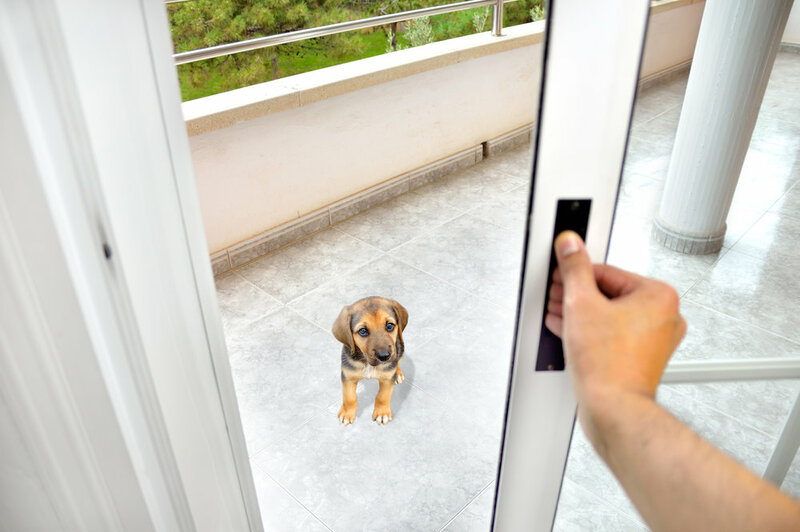 Often, a dog parent doesn’t know their dog is making distress vocalizations until they receive a complaint from a neighbor or building manager and many people face eviction if they cannot help their dog learn to tolerate being left alone. 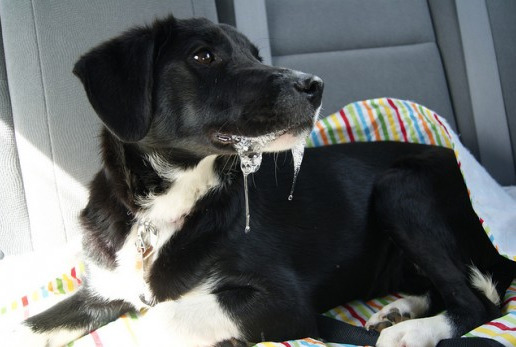 Excessive drooling when a dog is left alone is a sign of separation anxiety. If a dog drools or pants excessively, it's a sign that they are having a stress response to being left alone or isolated in a small, confined space like a crate. Caregivers often return home to find their dog soaked by their own drool or panting so hard that it seems as if they have heatstroke, but these are signs of being panicked or feeling trapped by isolation or confinement. Often, if a dog is allowed to roam free when home alone, the drooling or panting is accompanied by pacing behavior. Some dogs walk or trot along a specific path in a fixed pattern, others move around in circular patterns, but both are signs of the dog's agitation and discomfort over spending time alone. Some dogs will chew on objects, door frames or window sills, dig at doors and doorways or under fences, or destroy household objects when left alone or separated from their guardians because they are bored. Dogs with separation anxiety or isolation distress, however, usually display destructive tendencies within 20-30 minutes of their human’s departure as a means of trying to cope with the frustration or anxiety of being left alone. They may destroy anything they find nearby or around the house, gnaw on furniture, and may even get into the garbage as a means of venting their frustrations, but these behaviors don’t usually occur when their guardian is present. This is different and distinct from dogs with containment phobia, who will actively destroy crates or thresholds in attempts to free themselves from confinement whether a human is present or not. This dog has containment phobia and chewed through this entire door when locked behind it. He stopped being destructive once given free reign of the house. A dog with containment phobia might try to escape from an area where it’s confined whether or not it’s left alone or separated from its guardian. It may also attempt to dig and chew through doors or windows, break free of its crate or kennel, or may even dig under or jump over a fence, all of which could result in self-injury, such as broken teeth, cut and scraped front paws and damaged nails, or facing unpleasant consequences as a result of roaming free outside once the dog escapes. Early signs of containment phobia are claustrophobic reactions when left in a crate. This same dog or puppy is also more likely to scramble to jump over a gate or knock a gate over when contained in a room. Climbing out of exercise pens. An ability to open doors with lever door handles. Destroying exits when contained in a room. This could include doors, windows, window coverings (such as curtains and/ or blinds), etc. Chewing through leashes when used as a means of containment. When sufficiently contained in the backyard, destroying the entryways into the house trying to get back in. Ongoing attempts to escape kennel runs. Chewing through a fence or wall. Chipping teeth on a chain link fence trying to escape. Many dogs or puppies will experience some form of separation anxiety or isolation distress when first left alone, but will eventually learn to self-soothe and settle down for a nap or entertain themselves with a puzzle toy or kong when their owner leaves. A dog regularly digging in the trash is more often a symptom of cabin fever and a need for more diversity in their diet than a home-alone disorder like separation anxiety. These behaviors can range from being destructive in nature—like gnawing on a furniture leg—to being more of a nuisance in nature—like knocking over a trash can to scavenge for food—and more likely signify a way for the dog to occupy themselves when they find they are left alone. These dogs are not panicked by isolation or separation from their guardian, just frustrated or bored by spending time by themselves. They may be puppies with excess energy or an adult dog that requires more mental and physical stimulation than they are receiving. taking a dog to daycare. While all dog anxiety disorders require some form of rehabilitative training, the treatment may vary depending on the type, severity, and combination of symptoms a dog has. For instance, a dog with mild containment phobia may not have isolation distress and will often benefit from being given free access to their entire residence, whereas, this solution will not make a difference for a dog suffering from separation anxiety or isolation distress. Dog separation anxiety, isolation distress, and severe containment phobia can only be resolved by changing a dog’s Conditioned Emotional Response (CER) to being left alone or confined. This can be achieved in stages by implementing regular calm down periods that can be referred to as “Doggie Decompression” to teach a dog to spend time by themselves while their human counterpart is present, but separated from them with the use of a barrier or tether. Doggie Decompression must be implemented along with a systematic desensitization and counterconditioning training protocol known as "Alone Training" that teaches a dog to settle down in response to their human’s departure routine. Guardian is present and within sight of their dog but separated by a barrier. Doggie decompression requires using a gate, tether, or using an exercise pen to erect a barrier to help teach a dog or puppy to spend time by themselves. Tethering a dog or puppy to a piece of heavy furniture where a dog or puppy can comfortably spend time NEARBY AND WITHIN SIGHT, BUT SEPARATED from their guardian. Guardian works toward short absences as they move through a mock leaving routine. Alone Training helps acclimate a dog to being in at home when no one is present and is an essential part of helping them feel secure when they inevitably find that they are by themselves during work hours. Phase 3: inducing a dog to settle down in response to absences that only last 1-3 seconds, 5-7 seconds, and 12-15 seconds, before leaping to 30-second increments and longer, once a dog shows they can tolerate it. Dog separation anxiety training: Teach a dog to sit or down-stay while you go to another room. Teaching a dog to stay in a sit or a down can be a useful tool for helping a dog feel calm about seeing their human walk away from them and go out of sight for short periods. A stay is also a great way to teach a dog impulse control with the side benefits of being good for their mental health by expanding their repertoire of skills, a sure way to help boost any dog's confidence. An example to work toward would be having a dog lie down and stay on their bed while their guardian goes out of sight for brief periods. This also paves the way for teaching a dog independence by not allowing it to constantly be in a guardian’s lap or resting at their feet. installing a dog door so that a dog has free access to both indoor and outdoor areas of the home. regular enrichment exercises like basic manners training and plenty of outdoor exercise in the form of long sniff walks, hikes, and off-leash playtime. Getting a second dog, if possible, can be a solution for dogs suffering from isolation distress and separation anxiety. allow the dog or puppy to accompany you on chores or while running errands. If a dog guardian has exhausted all their resources and options, getting another dog is a possible solution to providing a dog with a home-alone disorder some company during the times its guardians are absent. You can also look for puppy training services who can help diagnose and treat the underlying problems. Once established, separation anxiety in dogs can be really difficult to rehabilitate and can wreak havoc in your day-to-day life. Angry neighbors may complain about the noise, management companies sometimes threaten eviction, and your social life may suffer because it's impossible to leave your dog alone. How many hours will your dog be alone? What time will your dog get up/go to bed? What time will the dog’s walks be? What time will the dog eat? Can someone return at lunchtime or during the day, to provide a toilet and play/training opportunity? What measures can you put in place when you first go back to work to help ease the dog into the transition? The more prepared you are, the better your chances of helping your dog transition to how life will be once you're back at work or otherwise gone from home. When you first bring a new puppy or dog home, your initial task is to help them feel safe in your house and safe with you. This can be achieved by putting their bed by your bed, or if you don’t want your dog in the bedroom, put a gate up on your bedroom door and your dog or puppy’s bed just on the other side of it. Creating other safe spaces for your dog or puppy to spend time while you are nearby but separated from them by a barrier is an essential first step towards helping them accept being alone. Erecting a puppy playpen or creating a long-term confinement area with a gate or exercise pen gives a dog or puppy space to roam around where they can also learn to entertain themselves. How To Prevent Dog Separation Anxiety: Setting up a long-term confinement area for your dog or puppy helps learn to spend time by themselves. An added bonus of confinement areas is that they keep your new puppy and dog out of trouble when you're not actively supervising them which helps tremendously with potty training. Lastly, think about taking your new dog with you when you go out if possible, or have someone sit with them at home if you can’t. Take some time off work, if you can, to help your dog settle in during this time. Have in mind what things will ultimately be like on a daily basis for your dog and work towards getting your dog used to that new routine. Alone Training helps acclimate your dog to being in your home when no one is present and is an essential part of helping them feel secure when they inevitably find that they are by themselves during work hours. You may think your dog can handle being by themselves, but unless you try leaving them alone first, you will not know. Alone training can help you determine whether your new puppy or dog can tolerate being alone without having a panic attack, so definitely make time for it! All that is involved is pretending to go through your leaving routine without actually disappearing for very long--at least, not at first. You will only need about 5-10 minutes to get started. Always make sure your dog has had a bathroom break and a walk to ensure they will be able to settle during this exercise. It’s ideal to allow your dog or puppy to settle down anywhere they want to for this exercise (so need to confine them). STEP 1: Put on your coat/pick up your keys/get ready. Use a specific phrase which tells your dog that you’re leaving but will be back soon (‘I’ll be back’ or ‘See you later’). Go out, and immediately come back in again. Ignore your dog completely until they settle themselves into a down (down = laying down). STEP 2: Say your phrase, go out again, and immediately return. Ignore your dog completely until they settle themselves into a down again. Repeat this as many times as it takes until you see your dog has stopped being at all interested in what you’re doing, and either become absorbed in the kong or is in a dozed relaxed state. STEP 3: Repeat as above but now go out and wait 5 seconds. Return and repeat until your dog is relaxed in a down. Gradually increase this time to 10 seconds, working up to 30 seconds and 1 minute, as you see that it gets easier and easier for your dog to relax. NOTE: You may progress through all of this in one or two sessions. Or, if your dog becomes hyper-alert and worried when you go out, it may take you a week and several sessions a day. A lot depends on your individual dog. Once you've reached the 5-minute mark, you might like to start walking away from the house, and then turn and walk back to the house again. Repeat this until your dog is completely relaxed. Work up to 10-15 minute increments. If you have a corner shop near you, go and get the paper or some milk. By the time you reach this sort of length of time, the number of repetitions you’re going to be able to do each day is much fewer. Try to get a couple of sessions in each day. The good news is that the first 15 minutes of being left are the hardest time for any dog, and the time when separation anxiety in dogs is most likely to kick in. If you’ve reached this length of time with no problems, it’s very likely you’re in the clear! Dog training expert Alexandra Bassett is the owner and lead trainer at Dog Savvy Los Angeles, a Los Angeles dog training company that specializes in positive dog training and solving problem dog behaviors like dog separation anxiety, leash reactivity, and dog aggression. She is certified as Knowledge Assessed by the Council of Professional Dog Trainers (CPDT-KA) and is available for online dog training sessions via Skype.